As usual, I’m not giving amounts for the salad cause you can use more or less of whatever you want. The recipe for the dressing is given though. I start with green salad bowl leaf lettuce and radicchio travesio. 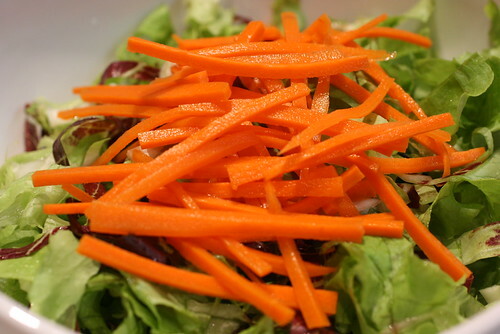 In Asian style salads, I like to use blanched carrots. (Just julienne the carrots and throw them in boiling water for a few seconds and then rinse them under cool water.) They have a great bright orange color and are just a bit more tender. I also julienne some seedless cucumbers, and then add my baked tofu chunks on top.